EA Sports Keeps NBA Live in the Game, but Can It Compete? At the time I asked about its readiness, EA Sports' next NBA game didn't even have a name. Peter Moore, then the label's boss, avoided my question and told me was doing so. "It's in the shape you would expect it to be for a title that's a year and four months away," Moore said at E3 last June. "There's a non-answer for you!" Today, we found out that EA Sports is ready to launch another NBA simulation and, wisely, it's going back to the NBA Live brand it built over 17 years, which bloomed on the previous console generation, wilted on the current one, and was jettisoned in a disastrous rebranding and makeover two years ago. NBA Elite 11 quite notoriously, was the first licensed sports title to fail to launch in more than 14 years, owing to a demo that in its best moments, showed off bland gameplay and in its worst, was mocked in million-view videos on YouTube. Today's confirmation of NBA Live 13 is nominally news,and it's hardly a surprise that EA Sports would distance itself from the Elite name and start over. Until we know how this game will be different, all it means is that NBA 2K will have a competitor after two years running unopposed. In the void left by Elite's collapse, 2K Sports turned in games that were, legitimately, the best in series history at the time of release. One of them, NBA 2K11, is still widely played more than 18 months later. NBA Live 13 is getting some goodwill publicity today but faces an enormous challenge from now until the first Tuesday in October, when both it and NBA 2K13 will hit shelves. It's going up against a sales and quality leader that has had two years as the only option for NBA fans. That's two years of them playing with its control set, two years of them building up players and franchises in their career modes, two years of playing with and against the sport's all-time greatest stars, all of whom, including Michael Jordan, have inked deals with 2K Sports. Only EA Sports has the muscle and the threshold of pain necessary to get back into this game. Any other publisher would have quit and, for a time, some were thinking even EA Sports would, too, until Electronic Arts boss John Riccitiello said, rather pointedly, "We're EA Sports, for Christ's sake." That brand is what keeps NBA Live 13 a credible threat even after all that's happened since 2009. Trust me, the folks at 2K Sports and Visual Concepts are mindful of it. Regardless of product quality, they know there are a lot of moms, dads, and casually interested fans who will go to a store, see EA Sports, hear "it's in the game," and figure anything under that nameplate is the leading title. It definitely grates on 2K and is part of the internal underdog culture there. In August, I had a Visual Concepts producer explain this to me in vivid terms: Look at what happened with PES, he said, referring to Konami's Pro Evolution Soccer. For years, it was the reigning soccer title, towering over EA Sports' FIFA franchise. What happened? PES got soft, failed to improve enough year-to-year, and FIFA's turnaround became magnified by that EA-Sports-for-Christ's-Sake brand. By the time PES knew it was in a fight, the fight was over. "We're not going to be PES," he told me, which is why you saw features like "NBA's Greatest" in NBA 2K12—a game being built with no competitor in a year that began with a labor stoppage. If ever there was a series that could have coasted a year and probably gotten away with it, it would have been NBA 2K last year. 2K Sports didn't, though, probably because it knows that basketball is really all it's got left. Any distance that can put between it and a parked competitor is ground 2K doesn't have to fight for later. So, what now? EA Sports will pump out some more information on NBA Live 13 on Monday, which a spokesman said will be "an all-new experience that captures the future of basketball." EA Sports can promote the hell out of what it is doing between now and E3 without worrying about diminishing an existing product on the shelves, and should take advantage of that. Indeed, today's let-slip tweet from Kyrie Irving, which confirmed NBA Live 13, coincides with the upcoming NBA All-Star weekend in Orlando, right in the backyard of EA Sports Tiburon, which took over the NBA project from EA Sports Canada. I'm curious to see if the game will bring back Kevin Durant, who was supposed to be the Elite 11 cover athlete, and who is just as bright a star today as he was then. He found out about the project's cancellation via Twitter, an ignominous end that deserves redress. NBA Elite 11 was also to feature an all-new booth team—ESPN's then-No. 1 trio of Mike Breen, Jeff Van Gundy and Mark Jackson. Jackson has since become an NBA coach, so his dialogue will have to be cut. Live 13 should keep Breen and Van Gundy, but what other presentational components must it incorporate after a two-year layoff? 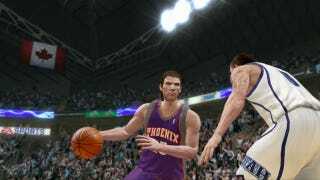 For NBA 2K13, 2K Sports doesn't really start talking about its next NBA game until Los Angeles, where NBA 2K typically gets a subdued reveal. 2K will want to continue to project the look of the undisputed leader, so I wouldn't expect that strategy to change. If 2K Sports doesn't renew its deal with Major League Baseball, that leaves the NBA as its only annual product, and you can expect the label to fight hard from its final stronghold. For gamers, though, the threat posed by EA Sports and the recognition of it at 2K Sports means they will benefit from something that has been largely missing from the sports genre: Actual, direct competition. It is nominally present in the soccer and baseball simulations; utterly absent in American football and ice hockey. Sports gamers have complained about a lack of choices and product quality for the past several years. That's why, regardless of how they feel about EA Sports or its handling of the NBA, they should cheer the return of NBA Live 13 today.